Get the professional-quality video security system you need to protect what you value most without having to pay for expensive installation. Defender PRO lets you monitor your property and customize your security system, your way. Perfect for any business or home application, you’ll experience peace of mind you never thought possible while knowing you did it all yourself with Defender PRO. No more port-forwarding or waiting for software to network your system. Simply download the ClearVu® app, scan the QR code and begin monitoring remotely in seconds. Quickly and easily play back months of high quality video footage stored on the included 2TB hard drive that only you have direct access to. Whether you are using 2 or 16 cameras, rest easy knowing your footage is safe and secure on your Defender PRO DVR. Recording capacity may vary based on recording resolution and quality, lighting conditionsand movement in the scene. Based on a 2TB hard drive, using lowest quality settings. Defender highly recommends the use of an Uninterruptible Power Supply (UPS) with surge protection for all products. Although the cameras are weather resistant, they are not weatherproof. Not for use in direct exposure to water, rain or snow. Will not honor discount code after buying 5 systems from them. My 5th system from Defender. This is the only once I've had to replace because the other one stopped working. My biggest issue is that I was given a "lifetime" discount code that the company would not honor. Not happy with the endless recording loop or the inability to actually talk to a support tech when you call. Excellent product providing us with the ongoing security we needed. The added memory on this product has given us more confidence for the purposes for which we purchased the security system. I have been using Defender products for years. Love the Easy setup and the simplicity to review videos. 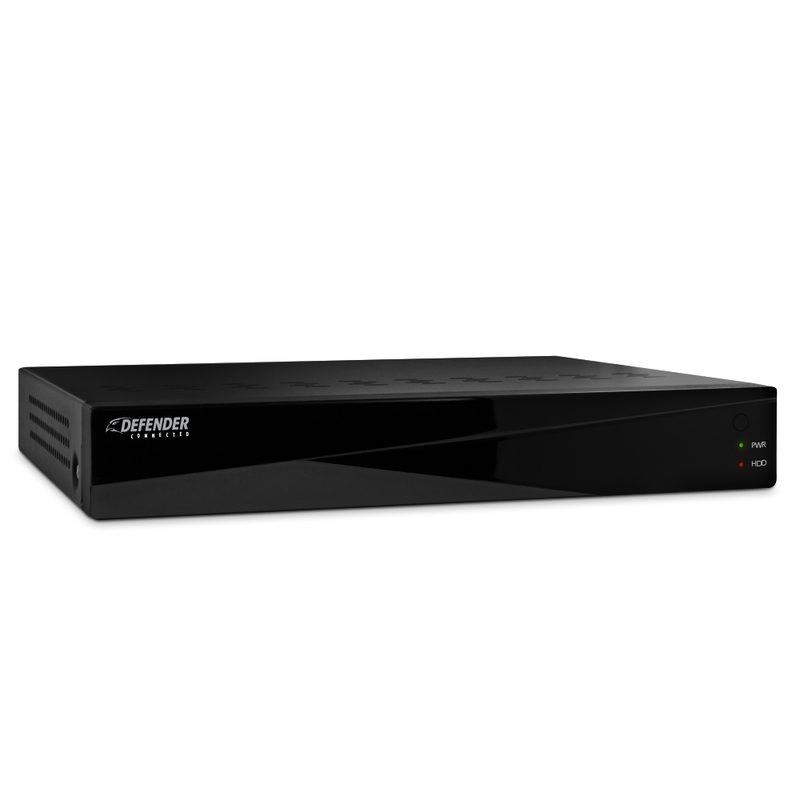 Purchased a system which included the 21150 (8) channel DVR, (4) 21146 cameras, cables remote and power supplies. All ports on the DVR and cables are clearly marked. I had the system up and functional in a single room in about 15-20 minutes after opening the box. Remote access with a laptop required the assistance of customer support and took about another ½ hour. Very pleased with all aspects of both the hardware and customer support. This system meets our needs for basic surveillance on a 5 unit rental property. The price was right for 8 cameras and a 2TB HDD. So glad I held off on buying one years ago. The widescreen cameras are crisp and bright. The cameras are also built like a tank. All metal top to bottom. I'm confident these cameras will last quite a long time. Worked right out of the box! But no instructions? Awesome, beautifully engineered, worked right out of the box.... but no paper-manual, and the instruction cd wouldn't play, either in my computer or on my blu-ray player. A quick chat on Defender's homepage fixed that, though.... a link to all downloads was provided, and they're sending me a paper-manual free! Only parts I added were stainless-steel screws with black-painted heads for mounting my cameras, and a 'borrowed' ;) VGA-cable to hook the DVR up to my TV. Plenty of cable provided; I hooked up all four cameras in my 1455sf ranch townhome, and had cable to spare even at the most remote location. Yay! I love the remote/mouse controls, and the IR image at night is superb! Consider this a four-and-a-half star review. Thanks again for a really nice product! Great DVR! Just as described. I bought this DVR about 3 weeks ago to replace a broken DVR for my security system. It arrived quickly and just as described. It was very easy to set up. I am very happy with my purchase. We bought this a month ago for security cameras around our home and like it because it doesn't take up much room, easy to operate, clear pictures and it works very well. I recommend it. Got this to replace an older DVR that no longer recorded. So far there are no issues and the upgrades from the previous dvr are much nicer. The only thing that doesn't work is the CD that came with it for the installation instructions, etc. It is very user friendly. I brought this camera system in February thru Groupon. The price was great and received it in a timely manner. I didn't get it installed until 8/5/14 and ran into a minor problem with one of the cables. After being frustrated about one camera cable I was able to reach a rep name Julie who resolved my frustration.